One perfect pad. I took this photo a few days ago when I noted it sticking up all alone and so perfectly. I have been using a sort of mantra in the last week, and I call it "ONE THING". I have been trying to use it to just slow down and appreciate everything. Food, activities, people, etc., by concentrating on the ONE THING I am doing at the time. I started out using it as a way to slow down and think more about what I eat, and how I eat. Now I find myself thinking of it in so many other ways during my day. I thought this one pad was fitting for me this week on Cactus Monday! 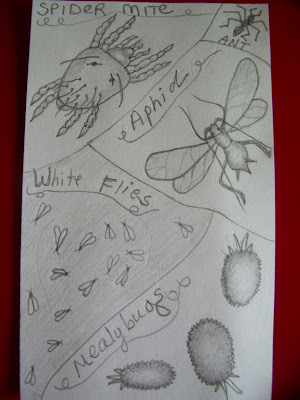 The name I had on this drawing is wrong, as pointed out by fellow blogger, Matt. I have noted it here, but cannot change my drawing...so just be aware of the error on my part)!!! Sorry...they are very similar looking! OK...my little picture of "Baby Toes". Just a little something to draw while listening to all of the scuttle regarding John McCains runningmate last night, and the continuing story regarding the missing little girl named Kaylee, and her Mom being re-arrested last night in the early morning hours! I think drawing keeps me calm during all of the news that can be so upsetting. Below is a picture I borrowed from the internet to show what I was going for in looks. Ain't they sweet? Now this looks like a fun project to make with my new grandbaby girl one day in about 8-10 years! A succulent purse! I found this at Bags To Check Out. 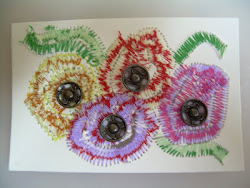 I would love to make one of these, but it would probably cost quite a bit of moolah! Oh...BTW...it is getting windy here, and we are already having rain bands with lightning and thunder (which Doozey just loves...NOT)...and I was thinking if I can get out tomorrow and try and get my succulent birdhouse put together, I will. It is getting a little rediculous now with all of these storms coming by. Amazing how large the swirling rain bands are coming out from the center of hurricane Gustave. I expect the next few days to be not so great weather-wise here. I'm glad we have the extra holiday day (Monday) off. We may need it anyway. Oh...here is another rain band coming through. Maybe I will go take a picture of the drawing I did last night till 2am, with my colored pencils...if I hurry I can get it posted before we need to unplug all computers here, and modem lines from the walls...if the lightning comes up again. I don't take chances with it anymore after once having a modem fried. I basically cannot live without my laptop any more...and that is a fact! My granddaughter surprised us today, and decided to come into the world! Everything went well, and Mom and baby both did fine! I am so happy! She weighed 7 pounds, 5 ounces, and was born a little before midnight over there (in Germany), which is approx. around 11:30am here, on today, August 30. I guess I can take down that newly revised baby ticker I had just put on the blog this morning!!! LOL. Thanks for all of your nice comments everyone!!! It feels great to have my new granddaugher born, and my daugher-in-law safe, and well. You know she is feeling a whole lot better by now!!! Yee haw!!! I will show you all a pic of her once one comes in, via e-mail! 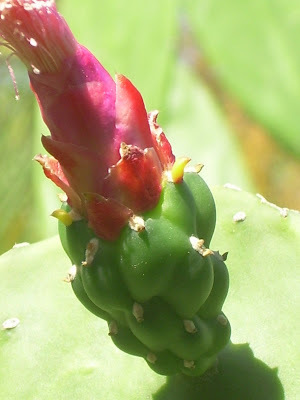 On Labor Day Weekend, August 30, 31 and September 1, 2008 from 10:00 a.m. - 5:00 p.m., at the Austin Area Garden Center at Zilker Botanical Garden in Zilker Park (2220 Barton Springs Road), the Austin Cactus and Succulent Society will host its Fall Show and Sale. The event is free and open to the general public. The show offers visitors a chance to see rare and beautiful cacti and succulent species from around the world. 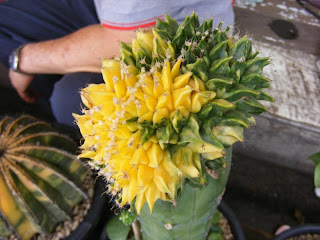 Vendors from Texas and Oklahoma will sell native and exotic cacti and succulents at reasonable prices. There will be a daily silent auction and hourly plant raffle of rare and collectible cacti and succulents. Educational information, literature, and expert advice will be available. Come and bring a friend. --------------------------Sure do wish I could be there! Can you make it,Claude??? I couldn't sleep last night...so got up and drew a picture from a book I own called "One Hundred Desert Wildflowers in Natural Color", by Natt N. Dodge. 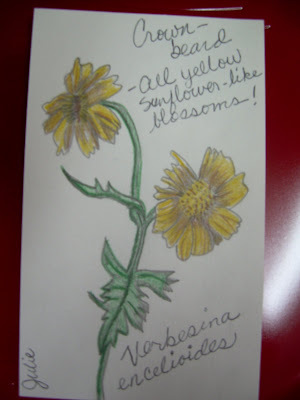 I used colored pencils after drawing it out on an index card...I did get the flowers a little too dark...these are actually a light yellow color. These wildflowers grow from Kansas to Texas, California, and northern Mexico. Sometimes they grow in clusters, but are found singly along roadsides and waste ground. They are widespread all over the desert from April to November (which is now)...The plant is known to have been used as a treatment for boils and skin diseases. The Hopi Indians boiled the plants in water, and then bath in it to relive the pain of insect bites! I stopped to take a few pictures tonight when I took my daughter to school, and look what I found! First...a Deep Sea Crinum, which I felt was so pretty with it's dainty little blooms! I had to take a pic for my blogger friend, WICKED GARDENER!!! This one is just for you, Wicked!!! Then I found a Stapelia Gigantea with a big old bloom (about 7 inches in diameter)...covered in flies! This one is for my blogger buddy, CLAUDE, cause he is waiting for his to bloom (well, I am waiting for mine to bloom also)! Now this is a very sad picture, and I actually did get a tear in my eye when I discovered the condition of some of my succulents tonight. They were still moved to the inner side of my screenroom since the tropical storm blew through last week, and I was holding out on moving them back on their shelves because there is another storm out over Haiti. I walked out to water a few of the plants that need it...and discovered my brand spankin new Thai Crown of Thorns...just sort of melted and is deadish! Oh my goodness. I started flinging all my plants back onto the shelves...got everyone a drink, and hopefully they will enjoy all their fresh air and sunshine tomorrow. This poor baby had to go to plant heaven. I'm sad. This happened in just 7 days. Meanwhile all the succulents outdoors, in full sun, fresh air, and sunshine and doing great. So I say, if it is temporary...I would err on the side of more air movement, sunshine and more water rather than less. If possible. End of sad tale. Goodnight. 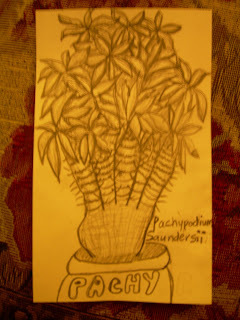 Here it is: My fabulous drawing of a Peyote Cactus! I drew it freehand from another photo in a book. That is why I shocked even my own self over it! My daughter says I used a form of shading called crosshatching...but I just kinda did it naturally...did not realize it was a REAL technique! LOLOL! This was a lot of fun...I have to admit...I am enjoying drawing more every day. Thanks for putting up with me, everybody! :) Oh...and BTW...my daugher starts DRAWING 1, in college on Wednesady night...and then she will give me classes based on what she has learned! I am so excited! Of course, first, I woke up to the cutest dog in the universe (well, ok...all of you all have the cutest pets in the universe...kitties, bunnies, turtles, birds, etc.)!!! We played and just sorta layed around together a while. (Best part...the laying around). My hubby went out to mow the lawn, and I decided to wrap and decorate my son's birthday present. Here are a few shots of it....a little hard to figure out because I wrapped it with comics from the newspaper, and then to make the card and tag, I cut up a Sephora bag, which is black and SHINY...perfect for a man! 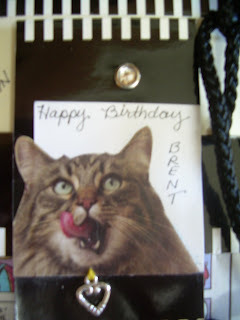 He and his wife love the felines, so I put a tiger cat on the front, and sewed a little heart charm under his chin! I had a hole punched in the center at the top for attaching ribbon, but I ended up having to cut some of the side of the card off, and then the hole was not in the center...so I filled it with just one clear rhinestone stud. I think he will love it when he sees it. 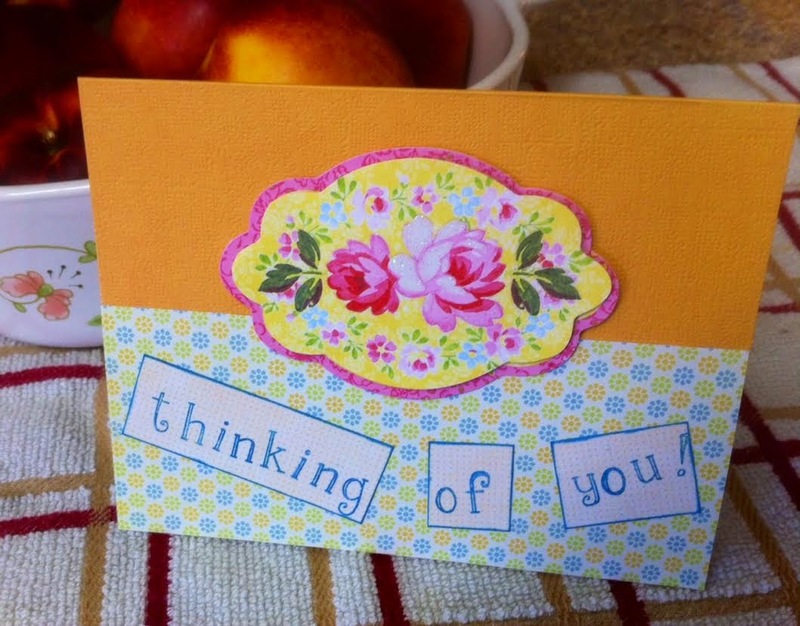 I made a long thin card (just the right size for a check) to match! I am hoping he can take his family out for a nice dinner on his B-day! Or maybe not...since their baby girl is due on Sept. 10, and his B-day is Sept. 14! They may not want to go out that soon...but I hope he will have a wonderful birthday whenever they can celebrate! I had ordered my wildflower seed packet from Burt's Bees a few months ago, and had since heard that they had run out! Well, I had a great surprise in the mail today...they arrived! I went to the website again tonight and they have posted that they have, indeed run out of seeds! I must have received one of their last packets! I will have to wait until mid-October to plant them here. I am so excited to possibly influence the bee population in some small way! I will also be planting my Zinnias, and Cleomes. Calendula, Shasta Daisy, Lance-Leaved Coreopsis, Plains Coreopsis, Purple Coneflower and Sweet William Catchfly...if anyone wants to reproduce what they sent out, and plant your own as well. They sent out over 50,000 seed packets which equals MILLIONS of flowers being planted across the country. YEAHHHHH!!! 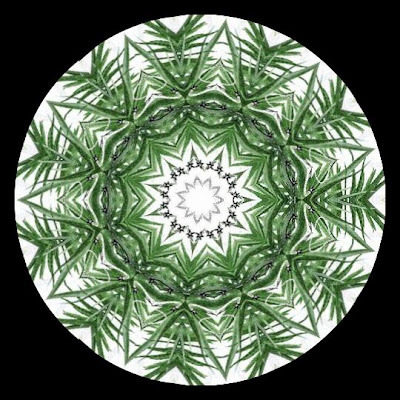 Changing my aloe mandala (below) to a kaleidoscope image!!! I took my basic mandala image and put it into Krazy Dad's Kaleidoscope Maker, thanks to CINDY reminding me of it! It is so fun to put an image into this thing and then manipulate it. Give it a try...but be warned...that it can be addictive. Hey, one thing Wikipedia says regarding mandalas is that in the West, a mandala is used to refer to the "personal world" in which one lives, the various elements of the mandala or the activities and interests in which one engages, the most important being at the centre of the mandala and the least important at the periphery. OK...I have been home the last 3 days with this dratted cold. I am bored to tears and tired of sleeping. I feel I will be up all night now after once again, sleeping all of the daylight hours away. If the cold doesn't have you sleepy enough, the antihistamines really do you in! I am feeling better and hope to be good as new in another day or so. If you can believe this, I have been unable to put my plants back on their shelves due to continued rain AND winds...residuals of Tropical Storm Fay. (I have no idea why I would capitalize her name and title, since she was nothing but inconvenience and soaking rains to my outdoor succulents). I believe I must have the worlds greatest drainage out there in my tires...my sweet little babies seem to go through all of these tortures from time to time and come out still as sweet as before...no rotting...good little babies!!! So far it has been 4 days of this weather misery....and 5 days of my own misery since I was thinking back and the old sore throat started on Monday. Oh well...glad to read about Mr. Brown Thumbs exciting adventures at the Garden Center Show (see my links). He is the best writer and gives you a good chuckle as well sometimes! I am hoping Succulent Dish (see links) gets her online class (or should I say "teacher") worked out OK...congrats to her on getting to college after all these years...it is admirable Succulent Dish!!! Tootsie Time (see links)is so busy every minute of every day working on gardening projects. She has made the cutest tea pot bird bath...just adorable! Hope Wicked Gardener (see links) is OK after the storm as well. You know this thing has just lingered over Florida so long!!! 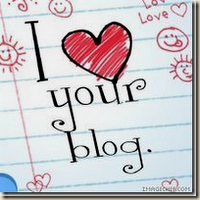 I am on my way now to read all of your blogs...fellow blogger friends! Thanks girl! I would like to share it with all of you in my links again...I know the rules are to share with only 5, but I say all of you are deserving and can pick it up if you wish to participate!!! Once you give me an award, it goes into Julie's Rules...which means I make up my own! Ha ha ha...I hope the AWARD POLICE are not out tonight! 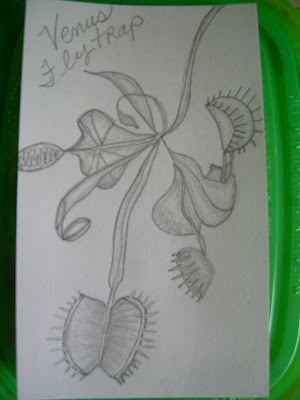 And a venus flytrap for you carnivorous plant lovers! I know there are a few of you out there! LOL. As you can tell, I am bored out of my gourd. I hope I can get to work tomorrow...need to...loads of stuff to take care of there. Have a happy rest of the week everybody! All is well here, post Fay! I ended up working today during the passing of the tropical storm, Fay...my company considered it a normal work day! There was solid rain and a little wind, but not too bad on the roads, which I was grateful for. When I got home, we had power, but one neighbor had lost hers, and it got fixed quickly, so that was wonderful. There were quite a few tornados all around Florida today, and quite a few places were damaged. We were under a tornado warning all day...but luckily I did not run into any myself, while working. Some cities farther north are under water. My heart breaks for them. I need to hear how the folks are on the west side of the state. Looks like it will now get out into the Atlantic and then strengthen to hurricane, and cross back over the top of Florida and then move north. What a zig-zaggy mess. As usual. Well...hopefully we will be fairly back to normal tomorrow. Schools will be back in session, here anyway. I am wondering about my friends in Clearwater, Lakeland, and Ocala...and worried about my friends in Gainesville. Goodness, this is exhausting. 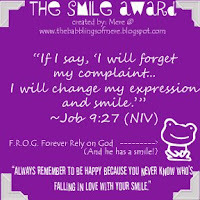 Another award was bestowed upon me by my sweet blogger pal, SOULBRUSH! Please consider yourself tagged if you are reading this...and share the love. Pass along to those you feel deserve it! I know I am breaking the normal rules, with these awards...but I like to leave them for everyone who may like to have one, since I consider all of you just wonderful! Well...we are all prepared for the storm! I got home from work, went to the store to stock up...we are expecting winds of 40-58mph, and heavy rain with flooding tomorrow between 6am-6pm, from this darn storm, Fay. My prayers are with my fellow bloggers on the west side of the state though! They have already closed school tomorrow (today was the first day here), and all county emplyees as well. I don't know what will happen with me as of yet. I am hoping to stay home because I have had a terrible sore throat all day today and just feel kinda crummy. I hope I will not lose power tomorrow...I will miss you all for a while until it is restored, if we do. I will return though!!! Everyone take care! I would like to share a poem written by my friend, CLAUDE regarding me not having a Pachypodium...I just think it is purely awesome and a lot of fun! I do not have a Pachypodium! A plant my soul doth covet. I promise that I'll love it! I even checked at Wal-mart! To ease my aching heart. What knight on noble steed? To sate this hungry need? In this, my darkest hour. 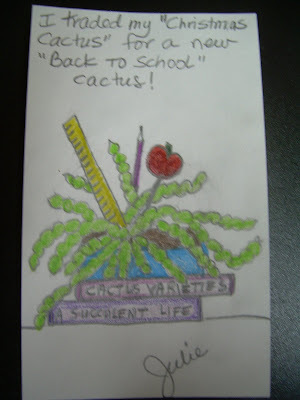 And now for my Cactus Monday contribution...an idea that had come in my head during the week, and I knew I had to draw it out! Good luck getting the kids all back to school!!! I recieved an award from SERENA....THANK Serena! Once again, I pass it along to any of you bloggers listed in my links...you are all deserving, and I appreciate you all so much! Enjoy! OMG! This web address was sent from my friend at Cactus Libya, that has 4 pages of absolutely stunning succulents and cacti for sale on the street in Thailand! I can only believe the growing conditions must be perfect there...I have never seen such perfect specimens! Check them out HERE. I want one of each one!!!!! 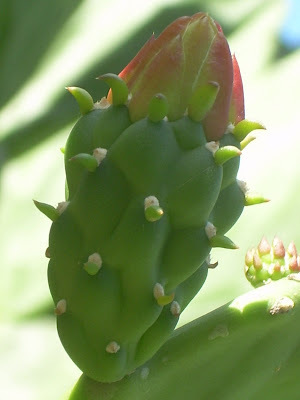 It is a really good looking succulent with a large caudex (the part that makes it so alluring to me), and it forms multiple arms with leaves at the top. It is VERY COOL. Pachypodium is a plant genus that belongs to the family, Apocynaceae. Pachypodium comes from Greek pachy (thick) and podium (foot), hence meaning thick-footed. All Pachypodium are succulent plants that exhibit, to varying degrees, the morphological characteristics of pachycaule trunks and spinescence. These are the most general features of the genus and can be considered distinguishing characteristics. The pachycaule trunk is a morphologically enlarged trunk that stores water so as to survive seasonal drought or intemitent periods of root desiccation in exposed, dry, and rocky conditions. Whereas there is great variation in the habit of the plant body, all Pachypodium exhibit pachycaul growth. Variation in habit can range from dwarf flattened plants to bottle shaped shrubs to dendroid-shaped trees. The second general characteristic of Pachypodium is spinescence, or having spines. The spines come clustered in either pairs or triplets with these clusters often arranged in rings or whorls around the trunk. Spines emerge with leaves, and like leaves grow for a short period before stopping growth and hardending. Spines do not regenerate so weathering and abrasion can wear away all but the youngest spines from older specimens - leaving smooth trunks and branches. To some extent, branches are a characteristic of the genus. Some caution is warranted in over-generalizing this characteristic. Pachypodium namaquanum is often branchless. Pachypodium brevicaule has no clear branches, and indeed may have evolved an alternative to branching in the form of nodes from which leaves, spines, and inflorescences emerge. In general Pachypodium have few branches. Since the environmental stresses and factors that contribute to branching can vary widely even in small areas, individual plants of the same species exhibit wide variation in branching morphology. Unlike many members of the Apocynaceae, including some members of the superficially similar Adenium, Pachypodium species do not exude a milky latex. Rather, the sap is always clear.Pachypodium are native to Madagascar and continental Southern Africa, i.e. Angola, Botswana, Mozambique, Namibia, South Africa, Swaziland and Zimbabwe. Here, at Bid or Buy I can bid on ONE (1) seed for this plant. WOW!!! 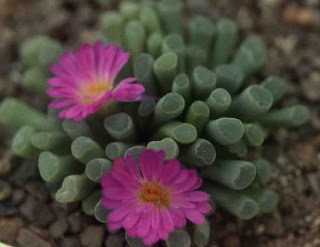 I have a secret wish to own one of these beautiful succulent plants! One with a big caudex! A miniature one, or one that has been bonsai-ed, for container (not planted in yard)! I can't seem to find one here locally, so will start to look online too. I may go to a Bonsai Society meeting this month and see if anyone has one there, for sale. Does anyone have a Pachypodium? I can't take a photo off the web, but would love to see yours if you have one! Meanwhile...on with my search! Just an appreciative thought to you all! So far I have used 2 index cards to create cactus on, and I need a storage system. I am thinking of buying one of those small plastic flexible photo books that holds 3x5 photos. I slip all my ATC's (which are smaller (2.5x3.5) into baseball card sleeve pages in a notebook. I really want to save my index card "art" as well. Anyone have any better ideas? Or have I come up with the perfect solution??? OK...here I am! 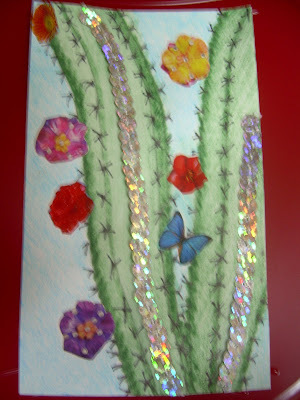 Amazingly, I made a little index card with watercolor pencil, and regular colored pencil, strands of sparkly silver sequins, and some cut out flowers. I call it "Looking At Your Cactus With Glitter in Your Eyes"! 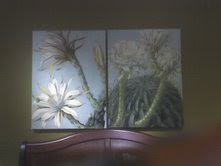 This cactus has fantasy flowers, and it glows and glitters because of your deep love for it! Happy Monday everyone! OK...not a REAL one...but this puzzle mantid was crawling around in my succulents after I built him and took him out for a walk! I found him, and a few other kits to build insects today at a dollar store. I could not believe my eyes when I saw the kit for this. It was fun to build real quick, and his new home will be amongst the succlents in the screenroom. I will keep on the look out for some real ones though, even still!!! End of big science experiment! The so called "tadpoles" I thought I had in a real young stage, turned out to be mosquito larvae! I nearly tossed my cookies! Yeeesh...I had to think of something to do immediately...so I poured dishwashing powder in the jar, and they died instantly! It was a "green" product...so then I went out and poured the jar contents into the other standing water areas in the wheelbarrow. Now as soon as my nausea resides, we will be leaving to go out to lunch! I'm glad I at least discovered these areas of standing water...I will go out and drill holes in them all when it dries up out there! Thanks to CINDY for helping me to I.D. the nasty things! Doozey in a maximum security position! A fast forming, and high wind and thunder storm just blew through, and Doozey fled to the place of highest security...between Grandpa and the big puffy chair...nice and snug! How cute! Somebody found some Mantids in Vero Beach, Florida...about 1.5 hours north of me. This is the closest pic I can find to what the one looked like that I found as a child. Photo credit goes to What's That Bug, where you can see many other types of Mantis...very interesting site!!! The first one you see is one from Florida...a bronze looking feller! Detective Doozey and I started out this morning heading to a sort of forested area near our house to search for the alusive mantis in south Florida. Well...um...I was driving on the road where I thought this county area was located...and...well...never found it. LOL. What road did I see this place on??? I've only been there like 5 times already. In my and Detective Doozeys defense, my husband has just told me that it is easy to miss, and is not marked very well. Ahhh...now I feel so much relief that I will not need a CAT scan of my brain...I mean it was I, not the other detective, who was driving...and she is really bad at navigational skills! We decided to visit a dog park instead, where absolutely NO mantis hunting was done...only frivolous play, running, and jumping! In the underside of this wheelbarrow I saw a bunch of squirming little things. On closer inspection I believe they are tadpoles. They were only in the water in this middle section. I decided it would be fun to take some of this water and little sqirmies in a jar to my kitchen window to observe. 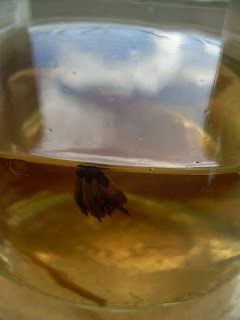 I put some of the dead vegetation in the water also, to make it a perfect habitat for the little guys. In the bottom of the jar...about dead center, in the bottom pic you can see a sort of straight little line...that is one of the squirmies!!! I will cover the top of the jar with a bit of nylon stocking so I will not come home one day to frogs jumping around in my kitchen! Some grape-like bunches hanging on my fence! I found spores on the underside of my fern leaves! I have always had a fascination with fern spores! OMG...am I giving you too much weird information about myself??? Some really beautiful dead frilly plant material! And a wasp or two. A needle-like dragonfly! 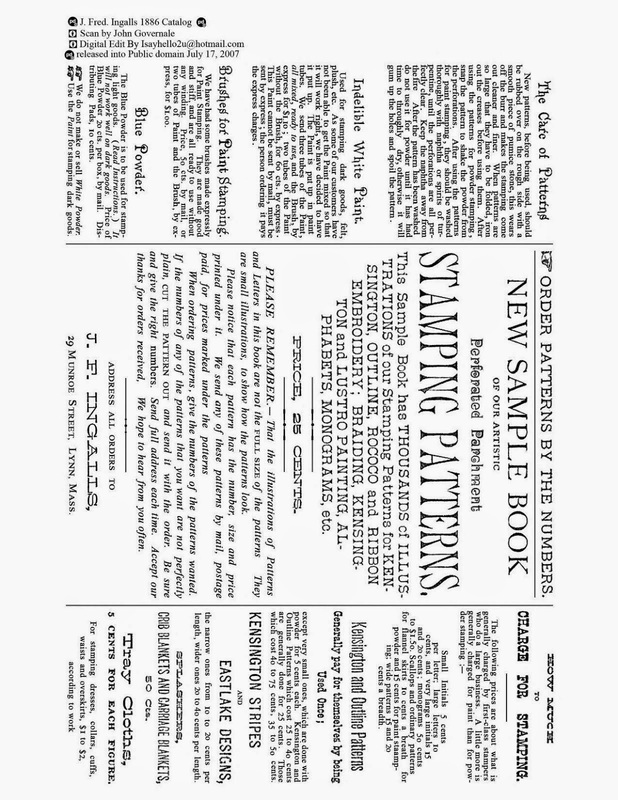 Click on pic to see better. Look at the beautiful skies this morning here in sunny south Florida! I had to take some close ups of this really green and pink/red cactus that I love! 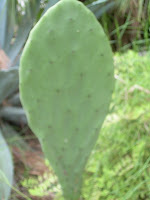 It is a spineless Opuntia, and quite huge! I thought it looked so lovely against the blue sky! Note the two ants on the right hand flower bud. Click to make larger to see easier....I didn't see them until I got the picture on the screen here! You get all my votes! To juice or eat whole? Another poem I wrote on my little trip!